Medical assisting is one of the quickest entry points into the healthcare industry. In addition, medical assistants (MAs) are emerging as one of the most in-demand jobs … which isn’t surprising, considering 76.4 million baby boomers are in the healthcare system in some way. The increasing demand for medical assistants — a 23 percent increase over the next few years — means pay is competitive, averaging $30,590 per year. Even better: The certification typically requires just one year of schooling. 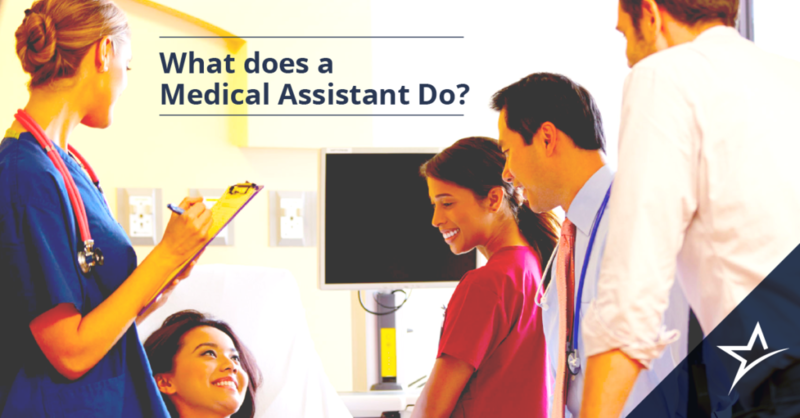 But what do medical assistants actually do? The daily tasks of a medical assistant can generally be broken down in two categories: administrative and clinical work. In many practices, MAs are expected to work both areas. Wherever you end up, you’ll need good written and spoken communication skills, analytical skills, and solid technical skills. Assist the physician or nurse while an exam is going on. Change dressings or remove sutures. Work with medical equipment, such as X-rays. Assist with the administration of medication. Help with authorizing prescription refills. There’s no real limit to what you could do as an MA, though. Different workplaces will have different specializations, and the day-to-day tasks MAs perform can vary greatly depending on what kind of work environment they’re in. Because the role of a medical assistant is so varied, you’ll find different expectations depending on where you work. Most practices expect medical assistants to have an educational foundation, be certified, promote a positive attitude of service, and keep a neat appearance. The first step toward becoming a medical assistant is education. You must graduate from an accredited medical assistant program. You can find MA programs at universities, community colleges, and healthcare schools. Most programs take about a year to complete. Ameritech’s accredited MA program takes 10 months, and prepares students to take certification tests to be a Registered Medical Assistant (RMA), National Certified Medical Assistant (NCMA), Certified Medical Assistant (CMA), or Certified Clinical Medical Assistant (CCMA). Degree in hand, medical assistants can then be qualified for CMA (AAMA) or other certification, and be designated by the American Association of Medical Assistants as a Certified Medical Assistant. Once you pass the CMA test, you’re a Certified Medical Assistant! Certification is not necessarily required to work as a medical assistant. As with any job, medical assistants must appear neat, clean, and professional. Many healthcare facilities and schools, including Ameritech, require a certain color or style of scrubs. Scrubs should be clean and pressed; shoes should also be clean. The MA’s hair should be neat, and fingernails must be short and natural. Many facilities require tattoos to be covered up. In the healthcare system where patients are not feeling their best, a cheerful smile goes a long way. You’ll be expected to be friendly and promote positive interactions with patients. Having a service mindset promotes positive experiences. Medical assistants are the right-hand men and women for doctors and nurses in need of all the hands they can get. If you have an analytical mind, a hands-on approach, and a passion for serving others, chances are you’d make a great medical assistant! At Ameritech, we’ve been training Medical Assistants for over 30 years, making us one of Utah’s longest-running programs. Visit our website to learn more about our MA curriculum, nursing, or other programs.